Get Bear Awareness Safety Certification Online Now! Bears may look cuddly, but they are apex predators and some of the most efficient killing machines in the wilderness. If you plan on spending any amount of time in bear country for an upcoming job, it is absolutely critical that you are well-versed in bear awareness training and knowledge — it could be the difference between life and death. Show your next employer that you take bear safety seriously by completing our 60 minute industry recognized bear awareness course. How Do I Get My Bear Awareness Safety Certification Card? Ready to get your bear awareness training and safety certification card in Alberta or any other province for an upcoming job? Good news — there’s never been a better time to take care of your bear awareness training in a way that’s convenient, interesting, and gets you ready and compliant for your next job! At the end of our approximately 60 minute course, you’ll simply print out your certificate and bear awareness safety ticket as proof of full completion of your bear awareness training requirement. What are you waiting for? 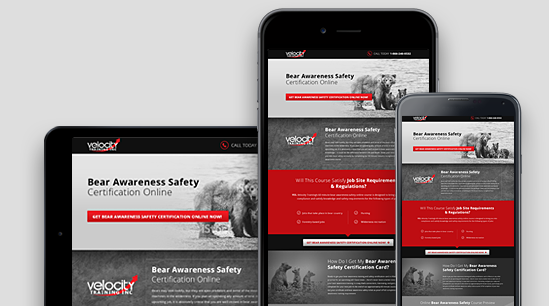 Take care of your Bear Awareness safety certification quickly and easily with a fun, engaging online course from Velocity Training! !